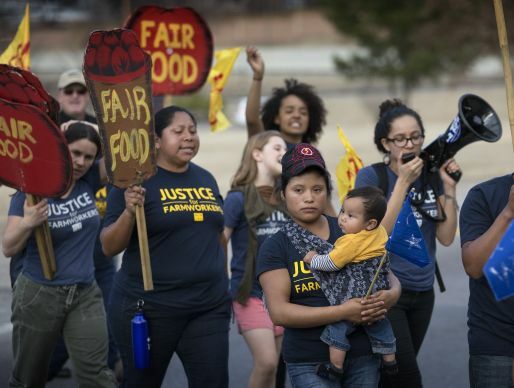 Members and supporters of the Coalition of Immokalee (Fla.) Workers march in Nashville, Tenn., to protest the Publix supermarket chain's refusal to join a farm workers' rights labor program. Nothing about picking tomatoes is easy for the workers toiling in the Florida fields from October to May each year. They earn low wages and sometimes face physical and verbal abuse. Through the deliberate efforts of The United Methodist Church and others, the lives of tomato pickers and other workers around the world have been slowly improving over the last decade. “What was once typical mistreatment — physical or verbal abuse or sexual harassment — is in the process of being eliminated,” tomato picker Lupe Gonzalo said through an interpreter. Gonzalo is part of the 5,000-member Coalition of Immokalee Workers, a 20-year-old organization fighting for workers’ rights. Those changes have been partly driven by the work of the United Methodist Board of Pension and Health Benefits and United Methodist Women. The United Methodist Church has been pushing for better workers’ rights at least since 2001. “In addition to our powerful new rights, in the past we didn’t earn a just wage for the challenging work that we do. Now we receive a more just wage — at least minimum wage,” Gonzalo said. The pension board believes a sustainable, stable and productive global economy requires the fair and equitable treatment of all workers and acts on those beliefs by having discussions with the companies in which the church is a shareholder. The board manages more than $22 billion in investments for more than 91,000 clergy and lay people in The United Methodist Church. How does the church create change through the pension board? The Social Principles of the church guide the work of the pension board, according to Kirsty Jenkinson, managing director and sustainable investment strategist for the board’s Wespath Investment Management division. The board is the largest reporting faith-based pension fund in the world, and the Social Principles contain the denomination’s teachings about issues in the contemporary world. Jenkinson said the board attends annual conferences and listens to the issues that concern members. “We have to prioritize. We have to be careful of single issues,” she said. The board has had more conversations with companies in the last 10 to 15 years about fair practices, and companies are becoming more aware of labor standards issues, she said. One church as well as an individual can make a difference in the campaign to improve workers' rights, according to a church agency executive. "Some companies are recalcitrant and others are enlightened," she added. Twelve companies have signed on for the Fair Food program, and an effort is under way to get Publix and Wendy’s to join, as outlined in a video produced by United Methodist Women. Tomato picker Lupe Gonzalo suggested joining a protest and letting the manager at Publix know that you are concerned about the supply chain of tomatoes and the challenging work to bring tomatoes to the stores. More information can be found at www.ciw-online.org/Publix. Anita Green, manager of sustainable investment strategies for Wespath Investment Management, said individuals can also exercise their votes as shareholders of companies in which they may own stock. “They may raise issues through the auditing process,” she said. There are eight U.S. companies “where we supported shareholder resolutions related to improving their anti-discrimination policies,” she said. They are American Financial Group, Crosstex Energy, Exxon Mobil, Leggett & Platt, Teco Energy, Universal Forest Products, AGL Resources and Conoco Philips. Colette Nies, a spokesperson for the board, says the board uses its influence as a major institutional and denominational investor to promote human rights, diversity, equal opportunity, and protection from discrimination, as well as health and safety standards, good working conditions and fair payment for workers. Discussions with companies can range from topics on equal opportunity, diversity, environmental issues with those in the developed world to slave labor, child labor and education in developing countries, Jenkinson said. “It may be too simplistic to just cut off child labor when that child may be supporting a family,” but you also want education for the child, she added. The work of the board and UMW goes beyond the tomato pickers and includes ongoing work with companies producing clothing in Bangladesh. A 2013 fire in which 112 died has brought more attention to worker safety issues. Wespath co-signed a letter encouraging 27 companies to participate in the Accord on Fire and Building Safety in Bangladesh. The document details how to make industrial buildings safer for workers. Worker representation was included. A list of companies that have signed the accord can be found atwww.bangladeshaccord.org. In 2008, the pension board engaged Walmart about the state-sponsored use of child labor to harvest cotton in Uzbekistan. The company has now stopped using cotton traced to Uzbekistan and works with suppliers to identify the source of the cotton used in the products it sells. The pension board began addressing labor standards with companies more than a decade ago on issues ranging from the labor conditions of cocoa trade workers in West Africa to worker safety in the global mining industry. “We can also effect change through our annual shareholder voting activity as we vote approximately 3,000 annual meeting proxies a year among the companies in which we are shareholders. In 2013 alone, we supported eight shareholder resolutions calling for anti-discrimination in employment,” Nies said in her statement. When the board approached Hershey to talk about child labor on the cocoa farms in West Africa, the company learned there were other issues in the farmers’ lives. The farmers had gotten older, and adult children were not coming back to work on the farms. The trees were also getting older, and “communities were struggling to make a livelihood.” Now Hershey has committed to buying only cocoa produced through fair trade standards by 2020. West African workers now receive text messages about diseases affecting trees, child labor issues and current market prices, said Anita Green, manager of sustainable investment strategies for Wespath. The messages are provided through a Hershey-sponsored mobile phone training program educating farmers in Ghana on best farming and labor practices. This year, Hershey released the results of three-year study showing farmers increased their yields by 45.6 percent. The farmers are part of CocoaLink, a program created by Hershey, the Ghana Cocoa Board and the World Cocoa Foundation. Along with the pension board, the United Methodist Women have been a powerful voice in pressing for better wages for the Florida tomato workers, Green said. The push to increase the wage from 1 cent to 2 cents a pound for tomatoes started more than a decade ago. “Now 12 companies and growers have finally capitulated because of all the pressure,” tomato picker Gonzalo said. Weaver is a freelance editor and writer in the Nashville area.